What are proximal humeral fractures? The upper part of the humerus bone forms the ball of the shoulder joint. It is relatively commonly injured following a fall onto an outstretched hand in older patients, while in younger patients it usually follows higher energy trauma. Often the fracture pieces are not significantly displaced, but ultimately treatment depends on the position of the joint surface and two important pieces of bone to which the rotator cuff tendons attach. Sudden onset of pain in the shoulder following a fall; with a difficulty moving the arm secondary to this is common. Bruising and swelling, which may track down the arm is common, with patients often describing a “clicking” or “grinding” sensation with movement of the arm away from the body in the first few weeks following the injury. Ultimately, X-ray will confirm the diagnosis. Many breaks can be treated non-surgically with pain relief and a sling for comfort for the first few weeks prior to commencing physiotherapy. 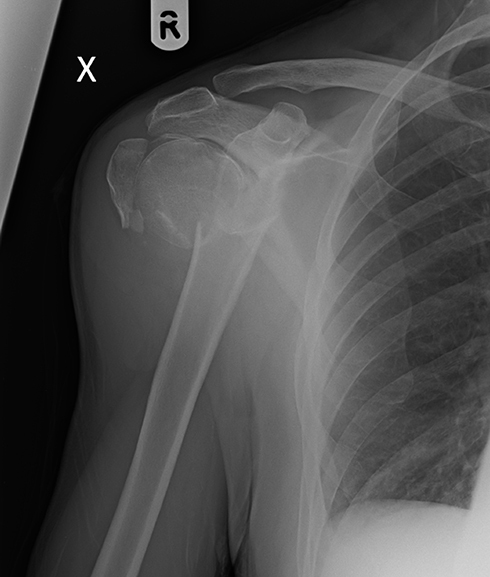 In some cases, the displacement of the fragments of the bone may mean that your outcome and ultimate shoulder function may be limited if left untreated. In this situation we may recommend intervention with an operation to improve ultimate shoulder function. 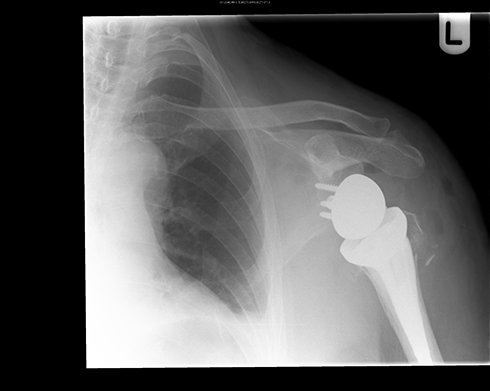 The two main surgical options are to fix the fracture using a specially designed plate and screws or to perform a particular type of reverse geometry shoulder replacement. The decision as to which of these is most appropriate is determined by many factors: patient age and number of fracture fragments are of paramount importance. 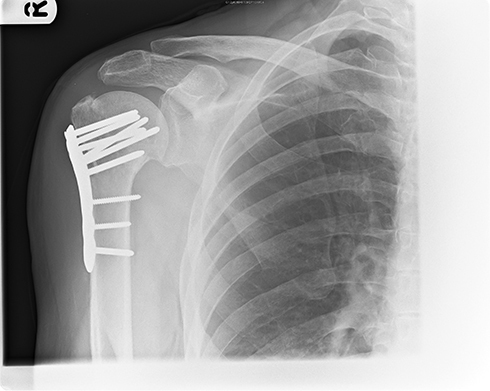 Detailed information regarding reverse geometry total shoulder replacement can be found here. 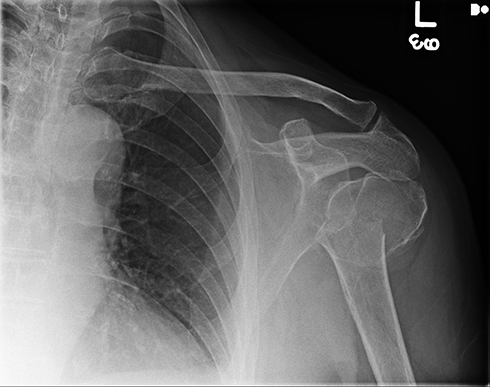 With plate fixation of a proximal humeral fracture complications are rare, but include a risk of infection, damage to nearby nerves/blood vessels and delayed or non-healing of the break despite surgery. The specific risks associated with reverse geometry total shoulder replacement can be seen in the shoulder arthroplasty / replacement section. A period of immobilisation in a sling is required, particularly until the wound has healed, and physiotherapy will be organised prior to discharge from hospital. Driving can often be resumed at around six-weeks, and return to contact sports considered 12 weeks following surgery.